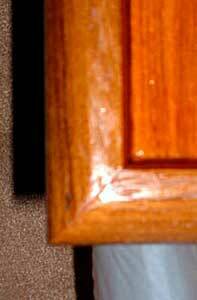 This includes making the cabinets softer by shaping the sharp edges and then glossing out all teak with varnish. 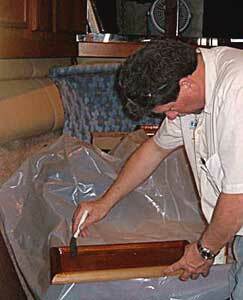 Cabinet doors are removed in the preparation of sanding all of the teak. Teak will then be varnished with a gloss finish. We feel this will up-date the look and make cleaning easier. 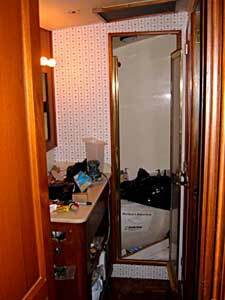 Doors under vanity were removed as well. 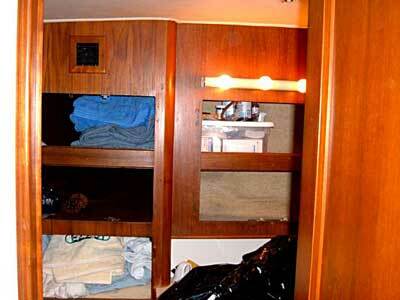 Another photo of the cabinet space. Note the door trim that will need to be varnished. There are three entrances into this head, all with doors and trim that will need to be varnished. 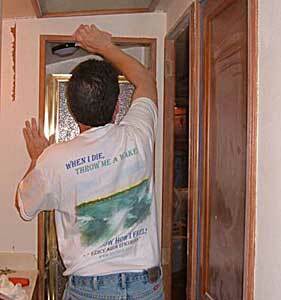 Additionally, the trim around the shower door will also need to be sanded. Sanding makes a big mess with lots of dust and having to remove the doors, tape areas, etc. It is a pain but the pay-off is this rich wood glow. The varnishing made a big difference in the way the cabinet looked and this is just one coat of gloss. The edges of all cabinet door were run through a 1" shaper to soften them. We knew we wanted a softer look and the "Camden Kid" Rusty Bryant came through with this idea. 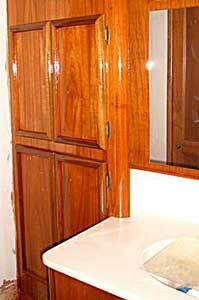 It utilizes the same doors so it is not exorbitant to do, particularly since they were going to be refinished anyway. Varnishing the cabinet doors. The V.I.P. 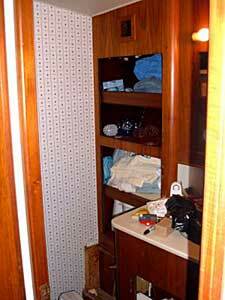 Stateroom is now my workroom. Sanding the trim in the guest head. A required evil. 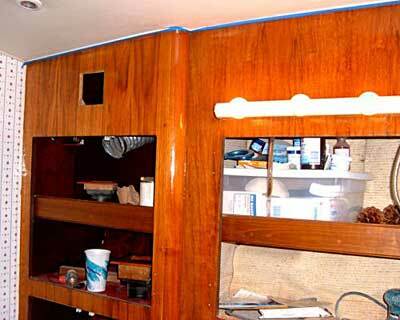 In this photo, the cabinet doors are back in place. We have not decided what handles we are going to use at this point. Note how much softer the cabinets look with the edges raidiused.